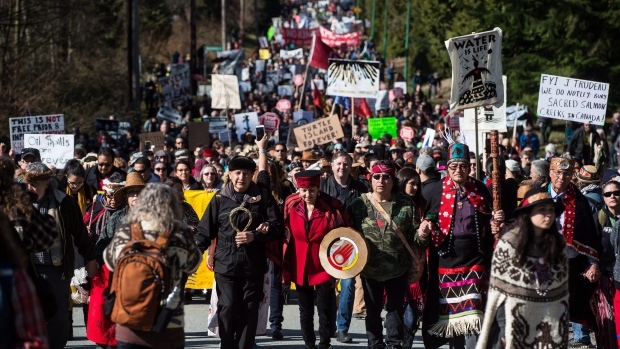 The ongoing saga of the Trans Mountain pipeline expansion fight between British Columbia, Alberta, the federal government, Kinder Morgan and various environmental and indigenous groups has led to a series of developments over the last few weeks. From Kinder Morgan Canada suspending all non-essential spending on the project to Alberta threatening to halt the flow of oil to B.C., the actions of leaders in this dispute have resulted in some striking images on the ground. BNN takes a look back at the latest developments in the Trans Mountain debate through pictures to show how tensions have escalated over time. Tensions started to flare in mid-March after the B.C. 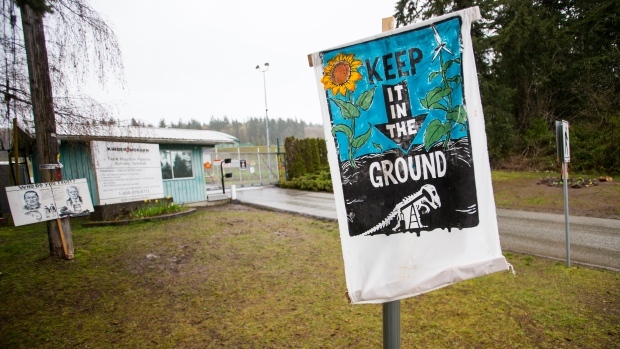 Supreme Court granted an indefinite injunction preventing protesters from coming within five meters of two work sites for the pipeline in Burnaby, B.C. 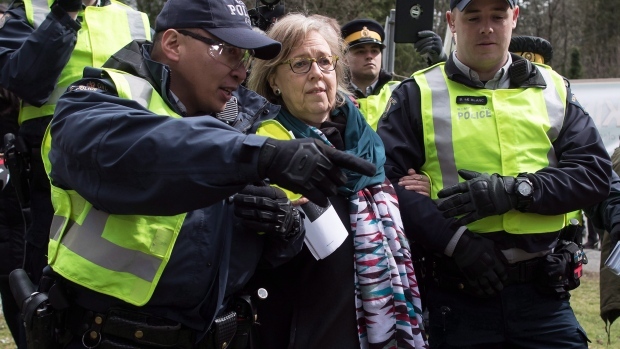 About a week after that ruling, Green Party Leader Elizabeth May and New Democrat MP Kennedy Stewart were arrested at a protest against the pipeline in Burnaby. On the same day of the arrest of May and Stewart, the Federal Court of Appeal dismissed a bid from the B.C. government challenging a National Energy Board ruling that allows Kinder Morgan to bypass local bylaws. But, B.C. didn’t wait too long to fire back. On March 27, the city of Burnaby said it would file an appeal to the Supreme Court over the Federal Court of Appeal’s ruling. 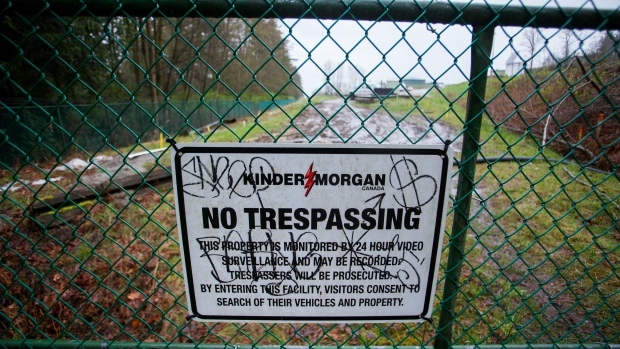 A big turn in the Trans Mountain pipeline story came on April 8 when Kinder Morgan suspended all non-essential spending on the expansion project and set a May 31 deadline to get clarity for its shareholders amid mounting political tensions. As pressure mounted on the federal government to resolve the dispute ahead of Kinder Morgan’s deadline, Prime Minister Justin Trudeau flew back to Ottawa from the Summit of the Americas in Peru to meet with B.C. 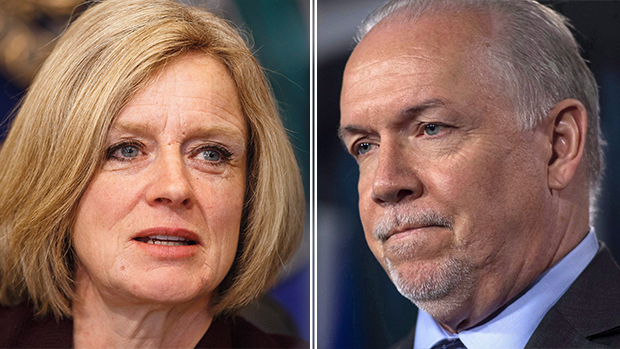 Premier John Horgan and Albert Premier Rachel Notley on April 15 to try to hash out a resolution. 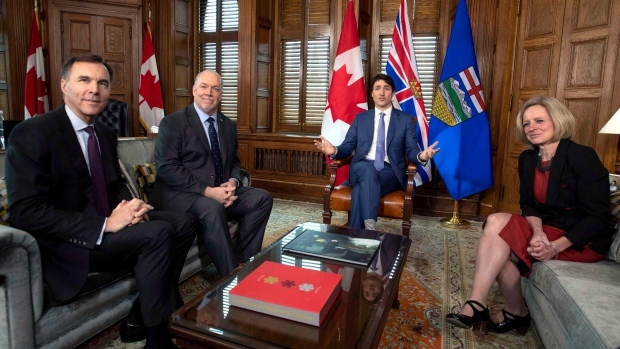 Trudeau, then, vowed that the Trans Mountain expansion would be built; promising to use both financial and legislative tools to ensure the project goes ahead. While the group appeared cordial in Ottawa, it didn’t take long for tensions between the two Western neighbours to rise the following day. On Monday, Notley introduced legislation that would give Alberta’s energy minister power to restrict the flow of oil, gasoline and natural gas to B.C. – which could potentially drive up gas prices in the province. In turn, B.C. threatened to sue Alberta over the move if it did result in gas prices skyrocketing. 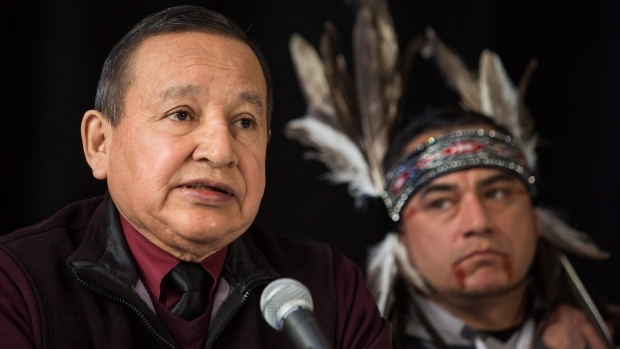 Later in the day Monday, First Nations leaders held a press conference in British Columbia to voice their strong opposition to the pipeline, along with Burnaby Mayor Derek Corrigan, who said civil disobedience against the pipeline will only continue to grow. 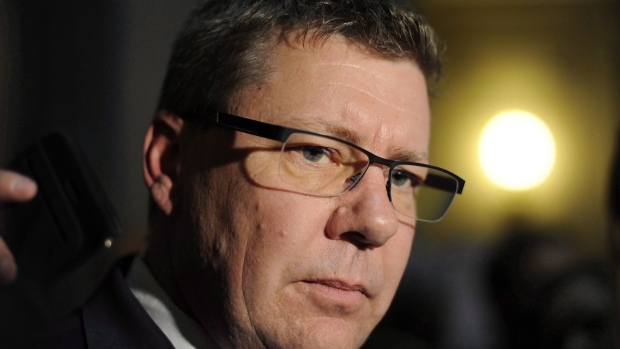 Adding more fuel to the fire, Saskatchewan Premier Scott Moe said Tuesday that he would follow in Alberta’s footsteps to introduce legislation that would restrict the flow of energy exports from the province to B.C. 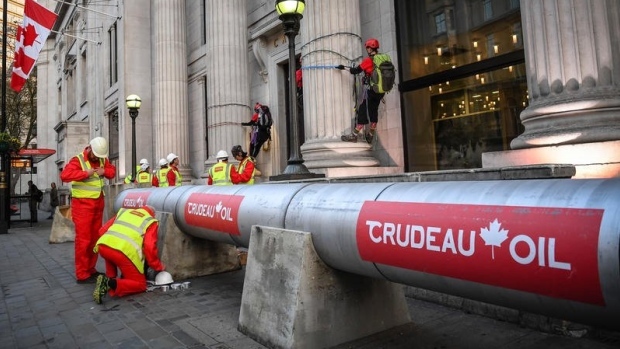 On Wednesday, the bitter debate over the pipeline followed Trudeau overseas when he was greeted by Greenpeace protesters in London, U.K. who had erected a fake pipeline labelled “Crudeau oil” around the Canadian High Commission. That same day, the B.C. government said it would file a pipeline reference case with the B.C. Court of Appeal, but added that it was not sure the ruling would come in ahead of Kinder Morgan’s deadline for the end of May. 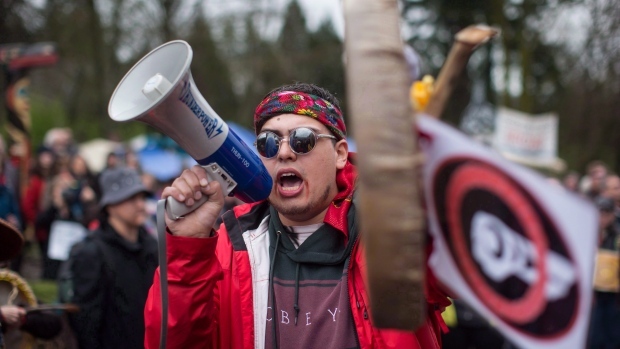 Another setback for the pipeline also came on Wednesday, when Kinder Morgan chief executive Steven Kean said that the federal government’s pledge to give financial support to the Trans Mountain project did not resolve the political risk from B.C.’s opposition. Shares of Kinder Morgan Canada in Toronto fell 3.5 per cent that day. The response from Ottawa on Thursday was that the government was still in talks with Kinder Morgan. Natural Resources Minister Jim Car said nothing had changed and the government was treating the company’s May 31 deadline as real.